I built a wooden bench to accompany my dining table. 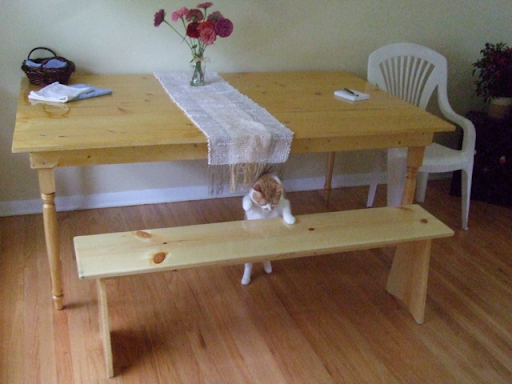 I built it out of matching pine wood, to be as long as possible while fitting within the legs of the table. I finished it with only high-gloss polyurethane. All sizes are actual dimensions, not lumber-yard "measurements". I used a power sander to round off all the corners on the seat board. I wanted a nice pretty smooth round shape, and I ended up with an imperfect outcome, but it was pretty good. I also sanded all the board surfaces, especially around knots. I wiped the board off with a damp paper towel. Knowing that I wanted to complete this task in minimum time, I began applying layers of polyurethane at this point. Although it would be undesirable to drill through some layers later, when I needed to construct everything, I just didn't want to wait to construct the entire thing before beginning the finishing process. If I were not pressed for time, I would have completed construction, then applied poly to the whole thing. The leg boards were the only part which required any finesse, by which I mean anything other than straight cuts. Using the best tools I could muster, a power jigsaw and a power sander, I finished the ends so they were exactly the same shape. I drew a curve with a pencil on one end and cut both boards with the jigsaw. This gave shape to the bottom of the legs, forming one little leg on each edge of the board. Measuring two inches from each edge of the other end of the board, I drew a straight line along the hypotenuse to the outside bottom edge. Actually I drew the line to a couple inches above the bottom, so that the little leg on each edge would have a bit of a square to it. Although I desperately wanted to cut that nice straight line with a circular saw, I could not do so safely with my limited tools, and I instead cut it with a jigsaw, and smoothed it with a sander. I heavily sanded all edges to make them as smooth and nice as possible. Creating the support bar required only a simple straight cut. I assembled the legs and support bar first by drilling through the legs into the support bar with a power drill. For all screws on the bench I drilled the hole, then flanged the hole with a countersink bit, drove a long lag screw, and covered the end with putty. Holding the parts for the substructure was tricky because I had no good clamps to work with, so I had to sort of hold it together and hope for the best. I started applying finish to the base structure. Whenever a layer was almost dry, I would add another layer. Careful not to touch the most recent almost-dry layer of poly, I moved the seat board into place and used a measuring tape to center it on the support structure. I put three lag screws through the seat board into the support board. I put one pair of lag screws through the seat board into each of the leg boards. I layered poly onto all surfaces, especially the top surface, until it was plenty thick and hard. 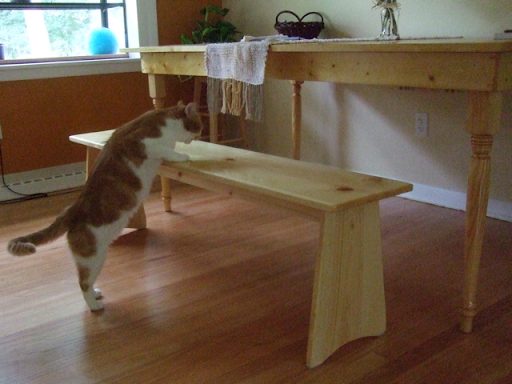 The bench was slightly tippy, so I sanded two legs until it sat flat on the ground; then I put felt feet on the bottom so it would not scratch the wood floors. You got a kitty cat! Good on you, what is the name? Rescue or kitten?